Abstract: Recent ex vivo studies depicted that organ function is not induced of a single cell type but due to a combined effect of cell-cell and cell-environment interactions. To design a useful cell culture models for lap-on-a-chip approaches it is important to replace 2D mono-cultures with 3-dimensional multicellular cell cultures. Such a cell culture technology requires proper methods for processing the cell carrier substrate and controlling cell attachment. With the aid of biotechnical multiscale engineering the most important geometrical features of a biological morphology can be defined . As a result, individual structures for favored organs can be designed. Due to the combination of different methods of microsystem technology and surface chemistry, so called BioLithoMorphie®, it is possible to transfer these structures to a cell carrier substrate, for example a (bio-) polymer [2, 3]. This procedure enabled the creation of a group of structured cell carriers out of polycarbonate (MatriGrid®), which mimic different organs for the use in drug testing, toxicity testing and stem cell research. 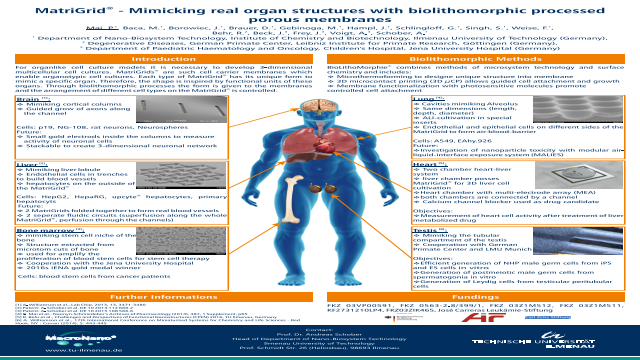 MatriGrids are established and tested for liver, brain, heart, bone marrow and testes .
. "Biolithomorphische Nachbildung einer Stammzellnische eines Organismus sowie Verfahren zu deren Erzeugung", Patent application Schober, Beck et al. DE 10 2015 108 566.6.